You know how you periodically change your oil and rotate your tires? Well your computer needs maintenance too. If you have a mac, and are lucky enough to have AppleCare, stop reading this post and dial 800-275-2273. 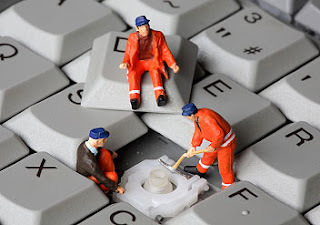 They will patiently walk you through a thorough maintenance of your notebook or desktop. In fact, look up when your AppleCare expires, (it's only good for three years,) and if you are within 3 months of the end date, call them and perform the above mentioned maintenance check with them whether you think you need it or not. Next, update your firewall and antivirus software (eg Norton.) Once updated, run the fullest, deepest, most complete scan your program offers. For an added layer of protection, especially if your anti-virus suite doesn't already do so, install and run a spyware removal tool such as SpywareBlaster. Then, if you haven't yet set up a back up system for your files, do that now. You have a choice of Carbonite, or Dropbox. Finally, now that your devices' insides are squeaky clean, it's time to give them a thorough physical cleaning as well. Wipe down your monitors with a damp cloth, clean the gunk out of your mouse (if you don't yet use a laser mouse) and wipe off your desktop tower and laptop exterior. Shake out and vacuum your keyboard, scrub the keys with a mild soap and water solution to remove oily buildup and remnants from the latte you spilled in there last week. If you use a desktop tower, now would be a good time to open the case and blow out any dust bunnies out of the fans. Helpful tricks and tips. Being a beginner, found it very useful.